Water—too much or not enough leads to big problems. For such an essential in our lives, we tend not to pay much attention to water until it affects us directly and immediately. Flooding, mudslides or drought have a way of focusing your attention. In the midst of excess or scarcity, it becomes a matter of survival and damage-control. Outside of urgency, we can consider our relationship with water without the heightened emotions that come with danger. When we lived on the west coast in the late ‘80’s, California had already suffered drought conditions for a number of years, with summertime brown lawns as the most noticeable impact. In student housing, we were given suggestions for conserving water. While “not enough water” was on our periphery, we never suffered from its direct impact. During two years living in Tampa from 2004-2006, the active hurricane seasons produced high winds, extreme rainfall and storm surges. We calculated how far our house was situated above Hillsborough Bay, wondering if 17 feet above sea level was sufficient. There were a few times pedaling my bike on Bayshore Boulevard where the standing water came up to my knees. My soggy rides may have been uncomfortable, but accidents because of water brought injuries or death for some patients at the hospital where I worked. Over the years, weather conditions have continued a volatile cycle; drought in parts of the US, affecting crops and leading to fire-prone landscapes, interspersed with severe rainfall creating overflowing rivers and streets and flooded homes. Drinkable water is a necessity. For those without a reliable source, polluted water puts people at risk for diseases. During a Rotary International clean water project visit to Honduras, we observed how a small village drew its drinking water from the same stream that served as the garbage dump. It’s clear to us that water and sanitation are connected, but maintaining the separation isn’t easy everywhere. Flooding can also corrupt potable water supplies as excess rain causes sewage treatment facilities or factory farm waste lagoons to overflow. In the US, we take it for granted that when we turn on a tap, clean water will emerge. The same can’t be said worldwide. 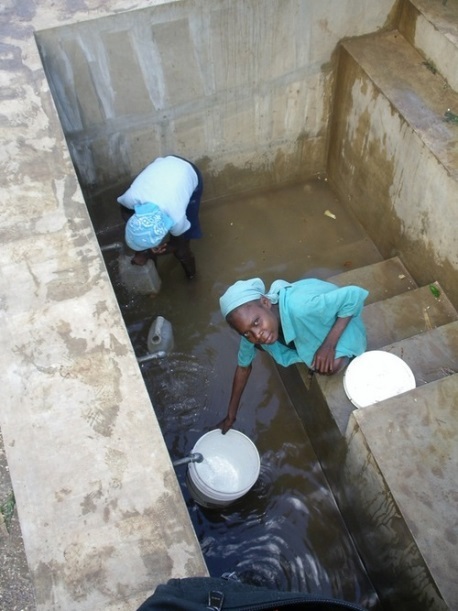 Lack of access to clean water and sanitation affects hundreds of millions of people. Approximately 13% of the world population has no access to safe water, either in their homes or within a short distance. Usually women and girls are the ones who spend part of their days walking to collect water; an essential chore that leaves them vulnerable to predators. Conscious water consumption does more than lower utility bills; access to clean water is a human right. We can all do our parts to protect water. For instance, we have implemented some “gray” water approaches to conservation. Three rain barrels connected to downspouts collect storm water, though they will soon be emptied with the approach of winter and freezing temperatures. Before our household on-demand hot water system produces hot water, a few gallons of cold water pour out. A bucket allows us to capture this water for re-use, instead of letting it run down the drain. A basin allows us to re-use water for watering plants. Some of those suggestions require more effort than just opening the tap and letting the water run down the drain. Since I don’t know if it will be good to the last drop, I don’t take water for granted, either with ease of access or confidence in its purity.